A romantic and thrilling historical adventure from the internationally bestselling author whose work Diana Gabaldon has called "Enthralling". Spain, 1748. Caridad is a recently freed Cuban slave wandering the streets of Seville. Her master is dead and she has nowhere to go. When, by chance, she meets Milagros Carmona—a spellbinding, rebellious gypsy—the two women become inseparable. Caridad is swept into an exotic fringe society full of romance and art, passion and dancing. But their way of life changes instantly when gypsies are declared outlaws by royal mandate and their world as a free people becomes perilous. The community is split up—some are imprisoned, some forced into hiding, all fearing for their lives. After a dangerous separation, Caridad and Milagros are reunited and join in the gypsies’ struggle for sovereignty against the widespread oppression. It’s a treacherous battle that cannot, and will not, be easily won. 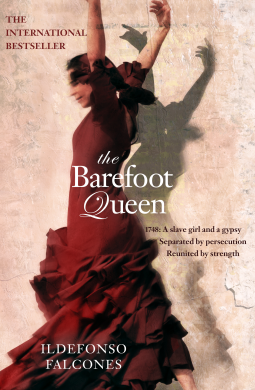 From the bustle of Seville to the theatres of Madrid, The Barefoot Queen is an unforgettable historical fresco filled with characters that live, suffer, and fight for the lives of those they love, and for the freedom they can’t live without. The Barefoot Queen is one of the best novels I've ever read. It has become an all-time favourite of mine. The setting is 18th century Spain, a brutal era where the gypsy people were persecuted, bringing to the forefront prejudics, adversity, and courage. The main characters are two women - Caridad, a freed slave who has always suffered abuse and neglect, and Milagros, who has always been surrounded by love and family. These two vastly different women are drawn to each other and soon, their worlds will collide bringing grave danger and immense changes to both their lives. The story culminates in a fabulously satisfying ending, with each subplot brought successfully to a close. Mr Falcones holds nothing back in recreating this violent period in history. He does not shirk away from describing the brutality, the sexual abuse of women, the murder of innocents. He tells the tale with a wonderful writing style that is rich and en pointe. The characters are so real, they were so memorable, I will never forget this story. This is a novel that will become a classic - it will endure for years and years to come. Truly brilliant!